Yamba is a town in northern New South Wales, Australia at the mouth of the Clarence River. Visiting Pippi Beach and Bundjalung National Park will get you outdoors. Satisfy your inner culture vulture at Evans Head Memorial Aerodrome Heritage Aviation Museum and Maclean District Historical Society Incorporated. Go for a jaunt from Yamba to Ballina to see Kayaking & Canoeing about 1h 20 min away. There's lots more to do: tour the pleasant surroundings at Main Beach Yamba, kick back and relax at Turners Beach, get up close to creatures of the deep with a dolphin and whale watching tour, and take in the pleasant sights at Angourie Walking Track. Planning Yamba trip won't be overwheling when you use's Insprock itinerary maker. Sydney to Yamba is an approximately 7.5-hour car ride. You can also fly. In April, plan for daily highs up to 29°C, and evening lows to 17°C. Finish your sightseeing early on the 22nd (Mon) so you can travel to Broken Hill. Visit Day Dream Mine and Synagogue of the Outback for their historical value. Get some cultural insight at Royal Flying Doctor Service, The Bruce Langford Visitors Centre and Mad Max Museum. Step out of Broken Hill with an excursion to Mundi Mundi Lookout in Silverton--about 30 minutes away. 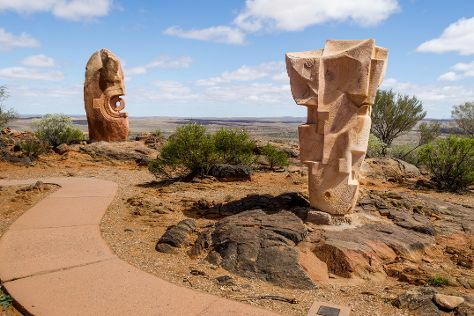 There's much more to do: look for all kinds of wild species at The Broken Hill Sculptures & Living Desert Sanctuary, admire the masterpieces at Pro Hart Gallery, examine the collection at Albert Kersten Mining and Minerals Museum (GeoCentre), and steep yourself in history at Broken Hill Trades Hall. For reviews, where to stay, more things to do, and tourist information, you can read our Broken Hill route builder website . Explore your travel options from Yamba to Broken Hill with the Route module. Expect a daytime high around 27°C in April, and nighttime lows around 19°C. Wrap up your sightseeing on the 27th (Sat) to allow time to travel back home.